A Winter Weather Advisory means that periods of snow, sleet or freezing rain will cause travel difficulties. * WHAT...Mixed precipitation. Total snow accumulations of up to two inches and ice accumulations of a light glaze expected. 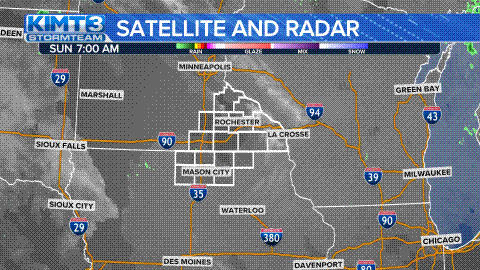 * WHERE...Portions of northeast Iowa and southeast Minnesota into southwest and central Wisconsin. * WHEN...To midnight CST tonight. * ADDITIONAL DETAILS...Plan on slippery road conditions. The hazardous conditions could impact the evening commute. A Winter Weather Advisory means that periods of snow, sleet or freezing rain will cause travel difficulties. Expect slippery roads and limited visibilities, and use caution while driving. The latest road conditions for Iowa can be found on-line at 511ia.org, in Minnesota at 511mn.org, and in Wisconsin at 511wi.gov or by calling 5 1 1. * WHAT... Additional snowfall accumulations of 1 to 2 inches likely this evening. Another round of snowfall is expected Wednesday evening through Thursday evening with total snow accumulations of 4 to 6 inches. Localized heavier amounts possible. * WHERE...Portions of central, east central and south central Minnesota. * WHEN...For the Winter Weather Advisory, until 9 PM CST this evening. For the Winter Weather Advisory, from 6 PM Wednesday to 6 PM CST Thursday. * ADDITIONAL DETAILS...Travel could be very difficult. The hazardous conditions could impact the morning and evening commutes. A Winter Weather Advisory for snow means periods of snow will cause primarily travel difficulties. Expect snow covered roads and limited visibilities, and use caution while driving. A Winter Weather Advisory means that periods of snow, sleet or freezing rain will cause travel difficulties. Expect slippery roads and limited visibilities, and use caution while driving. The latest road conditions for Minnesota can be found at 511mn.org and for Wisconsin at 511wi.gov, or by calling 5 1 1 in either state. * WHAT...Light snow expected. Flurries to a dusting of snow is expected. Light freezing drizzle may also occur from time to time. * ADDITIONAL DETAILS...Plan on slippery road conditions. The hazardous conditions could impact the evening commute. Another storm is moving into the area Wednesday afternoon through Thursday with winter travel impacts again expected over the entire region. Please monitor later forecasts for additional information. A Winter Weather Advisory means that periods of snow, sleet or freezing rain will cause travel difficulties. Expect slippery roads and limited visibilities, and use caution while driving. The latest road conditions for the state you are calling from can be obtained by calling 5 1 1. * WHAT...Snow ending, then a few hours of freezing drizzle. Total snow accumulations of 2 to 4 inches expected. Snowfall amounts may vary significantly over short distances. Ice accumulations of a light glaze possible. * WHERE...Dodge, Winona, Olmsted, Mower and Fillmore Counties.